Value Investing » Investing Guide » How to Calculate Profit Margin? 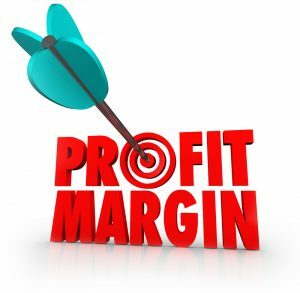 Profit margin is one of the simplest – and probably the most widely used – financial ratio used by companies. Another simple way to calculate a company’s profit margin is by dividing the profit by revenue and multiplying by 100. Profit margin can be applied to gross profit, operating profit and net profit. Each of them has its own corresponding profit margin. Profit margin is one of the most important financial numbers that a company can calculate. It is used in a lot of financial comparisons and determinations. However, it’s important to recognize that profit margin will incorporate a lot of noncash elements – depreciation can impact profit margin, as can changes in accounting techniques and methods. Standard profit margins vary widely between different companies and industries. In addition, some companies seek to minimize their taxes, and thus seek a lower profit margin. In other cases, low profit margin may be indicative of problems. Profit margin cannot be used alone to determine the financial prosperity of a company – many companies face a cyclical trend in their profit margin, and a high or low income is not necessarily correlated to a high or low profit margin. As mentioned above, profit margin can be calculated for any level of the income – the gross, operating or net income. What numbers and financial documents you use to find the profit margin will be based on which version you are attempting to calculate and what information you are trying to track. Profit margin is a helpful number, but remember that you need context for it in order to best understand what it indicates. Gross Profit Margin simply refers to the ratio of gross profits and sales. A company that generates good gross profits does necessarily runs a profitable business as none of the expenses (other than the cost of goods sold) has been accounted for in this yet. A very high cost structure can make the company unprofitable. However, Gross profit margin is a useful indicator to understand if the company is pricing its products appropriately and is able to source from its suppliers in a cost effective manner. Operating profit margin refers to the ratio of the operating profits and sales. As the name indicates, operating profit margin shows how efficiently the company runs its operations. This does not include costs such as SG&A, financing costs (interest, etc). Compare the operating profit margins if you want to understand whether the company is running its operations as efficiently as possible. Net profit margin refers to the ratio of the net income and sales. A good net profit margin indicates a highly profitable company. All the relevant costs in the period have been accounted for in this calculation.